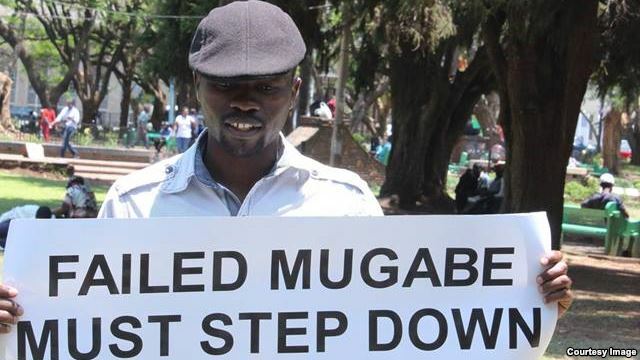 On 9 March, journalist-turned-activist, Itai Dzamara was abducted by five unidentified men at a barbershop near his Glen View, Harare home in Zimbabwe. He was then bundled into an unmarked truck and has never been seen or heard from ever since. Dzamara and a handful of colleagues wanted 91-year-old President Robert Mugabe to step down on the grounds that he had mismanaged the economy. The activist was leading a campaign called Óccupy Africa Unity Square´. The square lies a stone´s throw away from the President´s office. Dzamara had addressed an opposition Movement for Democatic Change (MDC-T) rally a few days before his abduction where he had called upon all democratic forces in Zimbabwe to forge ahead with the fight against Mugabe´s regime which has been accused of gross human rights violations by the international community. Mugabe and his wife were slammed with international travel restrictions as a result of the allegations. Dzamara had also been previously severely beaten and arrested by the police for his activism. Observers say the activist´s forced disappearance underlines the danger lurking in the country against political opponents. Activists have also for long accused Mugabe´s regime of heavy handedness when dealing with political foes. Dzamara´s abduction has once again cast Zimbabwe on the international spotlight. Campaigners calling for the release of Dzama have started a movement called “Bring Back Itai Dzamara campaign” which has received international support from most Western embassies but has been met with muted responses from African envoys. The United States and European Union have asked Zimbabwean authorities to investigate the disappearance of the journalist-turned activist .In July, the Australian Embassy in Harare said they were deeply concerned about Dzamara’s disappearance. A High Court judge has directed that a team of police detectives be deployed to work closely with Dzamara’s legal practitioners to search for him “at all such places as may be within their jurisdiction in terms of the law and report progress of such search to the Registrar of the High Court by 1600 hours every Friday fortnightly until his whereabouts have been determined.” In a by-monthly update to the High Court, the head of Law and Order in the Criminal Investigations Department (CID), Crispen Makedenge, said there have been no leads so far. Prayer sessions for the missing activist have also been held in Harare where organisers have alleged that the government was dragging its feet in investigating the circumstances behind Dzamara´s abduction and subsequent disappearance. MDC leader Morgan Tsvangirai has attended some of the prayer sessions and has laid the blame for the activist´s disappearance squarely on the feet of Mugabe´s regime. Mugabe has been in power since the country gained independence from Britain in 1980. Tsvangirai has said he holds “Mugabe and his regime responsible for this morbid and senseless act”. The MDC-T has lost some of its activists allegedly at the hands of state agents before. An MDC polling agent, Patrick Nabanyama was abducted by armed men in year 2000. It is widely believed that Nabanyama was murdered but his body has never been found. In May 2008, MDC´s Tonderai Ndira was abducted from his Mabvuku home by 10 armed assailants. His body was found a month later with multiple stab wounds, his eyes gouged out, his tongue cut out, and his neck, skull, jaw and knuckles broken. In fact, the MDC claims that more than 200 of its activists were killed in political violence that enveloped the country in 2008. In another case, Bulawayo war veterans leader, Cain Nkala was allegedly abducted from his Magwegwe home on November 5 2001 and subsequently murdered. His body was exhumed from a shallow grave at Norwood Farm near Solusi University about 40 kilometres south west of Bulawayo eight days later. Human rights organisation, Amnesty International has also waged into the Dzamara case. “He is a known critic of President Mugabe, his whereabouts remain unknown after he disappeared on 9 March 2015. We call on the incoming Southern Africa Development Community (SADC) chairperson, President Khama to encourage leaders in the SADC region to show respect for human rights within their borders and appeal to the leaders to ensure that member states that fail to respect human rights are held to account,” said the organisation´s director, for Southern Africa, Deprose Muchena in a message to SADC in August. “We are seeing a worrying picture of shrinking space for human rights in many countries across the SADC region. We´re also seeing the targeting and persecution of defenders of human rights”.